The power of data, especially ‘Big Data’. 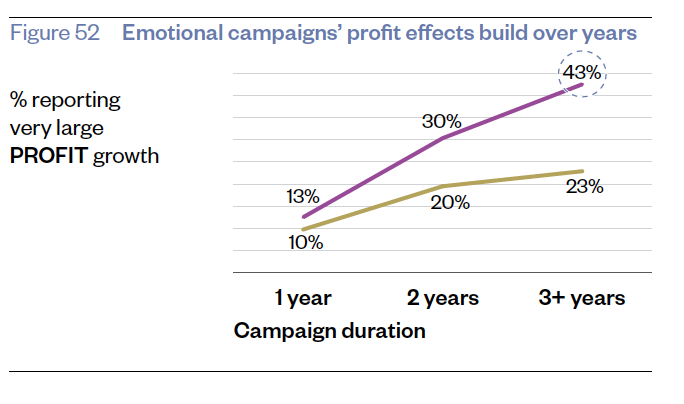 The power of emotional communication, mostly triggered by Byron Sharp’s “How Brands Grow,” and the (oh so dry but excellent) work of Field & Binet; “Marketing in the era of accountability,” and “The long and the short of it”. These works are by many seen as contradictory. That the use of data, big or micro, for communication is in opposition to the theory of emotional communication being stronger than rational. "If you measure success over the short term, as big data will push you to do, you will select marketing and communication strategies that deliver best results in the short term: unfortunately, these will not deliver best long-term results and in many important ways will undermine long-term success." Does this mean that data-driven communication means focusing on rational, short-term communication? Data gives me both emotional and behavioural insights. Through search and site analytics data I get how people behave around a certain topic, what their path to purchase looks like and what pushes them over the tipping point, to conversion. We can use that data to improve the experience, and therefore the conversion, throughout the journey. Pretty rational and pretty efficient. A source of data that is often overlooked is the emotional data we can collect. If search data gives me the insights to adjust people’s journeys, emotional data gives me the power to start new ones. Not too long ago I looked at a sentiment analysis for a high-performance car manufacturer. On a higher level it showed us that while there was almost 100% positive sentiment in social channels there was a 50/50 split between positive and negative on forums. So, people brag about their cars in social channels and turn to specialist forums for help with problems. By analysing a huge amount of conversations, we could see the topics creating positive feelings. It was all about the preparation, the anticipation of the next drive. And by just following specific conversations I got a good sense of this audience, their attitudes and language. This made them come alive as a “person”, not just a “persona”: A great start for great emotional communication, driven by data. Don’t let a data-driven approach force you into siloed rational communication, and don’t forget your data when you try to unlock the emotional insights for your communication. Because the most effective and profitable communication builds emotions. As this rational data shows. Source: “The Long and The Short of it”, Field & Binet, 2013.